It's funny how I forget about Whipping Girl all the time. When I meet people for lunch, she seems to slip through the cracks. Therefore, I have been making a concerted effort to include her in my food adventures. 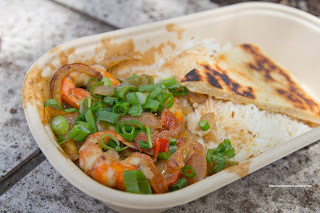 On a sunny afternoon (as rare as it has been lately), we met up in search of good street eats. 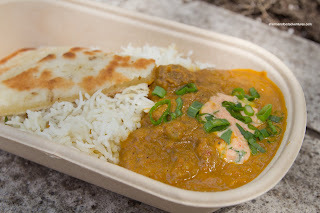 Originally, we were going to do Mangal Kiss, but the lineup was a big turnoff, so we headed down to Vij's brand new food cart venture (with Gourmet Syndicate). Yes, we went from one long lineup to an even longer one. 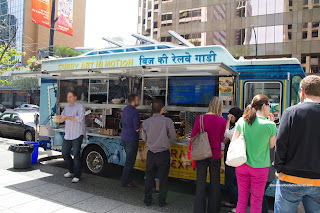 Vikram Vij himse lf was there to greet customers as well as offering cassava fries to the people in line. Since the food cart has been only a week old combined with the name Vij's, the curiousity factor was quite high. After waiting about 30 minutes, we finally put in our order. It wasn't a long wait before we got our 4 items. Yes, 4 items. Eating with Mijune all this time has totally brainwashed me... We started with the Goa Spot Prawn Coconut Masala Curry first. 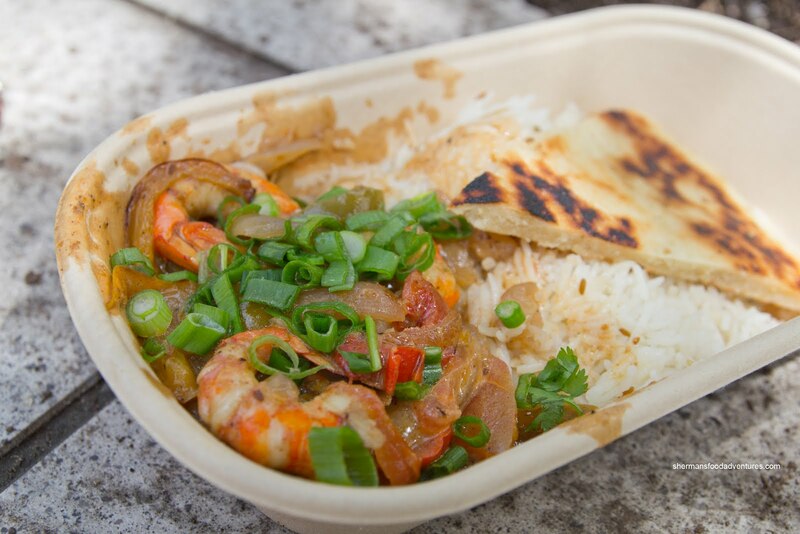 It consisted of exactly 3 spot prawns, Basmati rice and a wedge of naan. Our first reaction was, "this is really small for $11.00!". It was good though with the prawns being just cooked and exhibiting a natural sweetness. The curry had a noticeable kick and definite coconut slant. I mentioned to Whipping Girl that I wasn't the biggest fan of the naan, just like when I went to Vij's. She promptly reminded me she was there with me... Boy, I really do forget about her! Anyways, the naan is more like a piece of grilled pita and as much as it isn't bad, I much prefer a less dense version. Next, I devoured the Lucknow Lamb Kebabs all by myself partly because Whipping Girl doesn't like lamb. I say partly, because even if she did eat lamb, I wouldn't share. It was freakin' fantastic. The formed lamb "meatballs" were super moist and juicy with a tasty char on the outside. There was a multitude of spices including heat from chili flakes. The sweet red onion and fresh mint amped up the already impactful flavours. 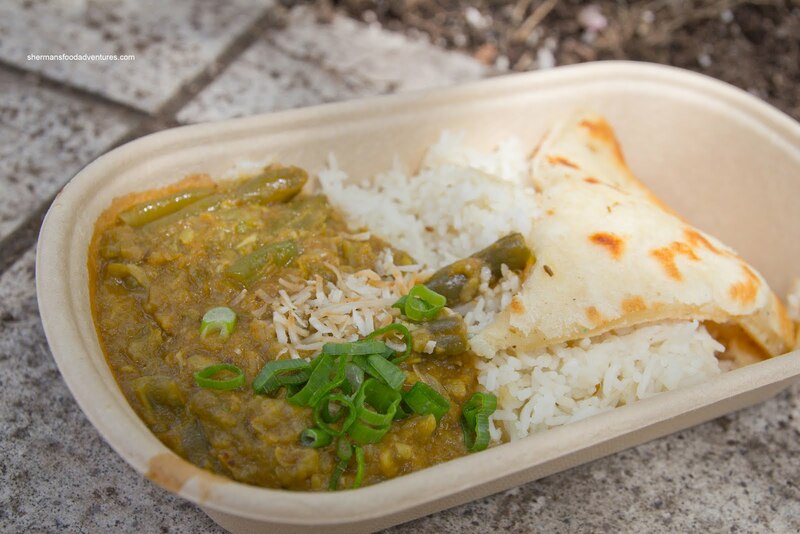 We also got the one vegetarian item being the Coconut Ginger Green Beans. There was no mistaking the flavours as both the arom atics of the coconut and bite of the ginger were there. The beans were, of course, soft due to its preparation. Lastly, the Jaipur Bison Curry left a lasting impression by offering up depth and spice along with tender bison chunks. I would've preferred to have less little bits of potato throughout the curry, but that didn't make or break the dish. In the end, the food was pretty decent. I'm not sure if one could actually get full on any of the offerings though. There is definitely a premium paid due to the Vij's namesake, yet no one buys a Mercedes because it is inexpensive either. Vij was in the selection committee. Can some cry "conflict of interest"???? Regardless, at that price, sorry, there is no way I am going to pay that. I would rather walk to the nearest shawarma shop (a bit of a challenge from their current location) and get one of their wraps or, if really hungry, a plate. Less $$$, more filling and, heck, at least I can *sit* without being affected by the weather! I agree, 11 for 3 spot prawns is a bit much. However, they are right outside my work so I'm sure I will succumb eventually. 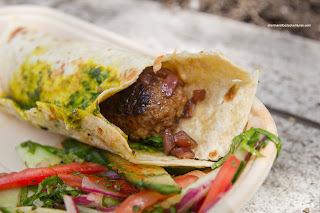 Vij has a food cart?! Any idea when this happened? Can't believe I didn't know this despite following the whole food cart scene in the media. Anyway, now very excited to try it! @KimHo Well, I'll leave the politics out of this one, but I will say that the food is not bad. It is pricey for what you get though. @grace Yah, it's not the best value out there, but the food on its own is quite good. @Allison and Michael LOL, things open up so quickly, it's hard to keep up!